Pete and I are not slogging through the mud in the mangroves like Dan and Alex. 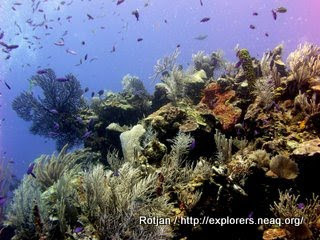 Instead, we face different challenges in the lab and on the reef. Every morning, we rush to check our fish feeding experiments, siphon, replace food cubes, and do whatever else needs doing in the wet lab. We then prep our data sheets and decide on the dive agenda for the day. 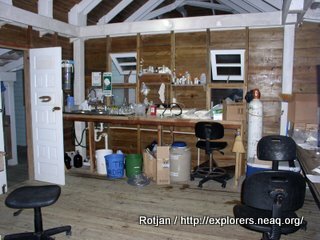 Then, it's dive-dive-dive all day long, followed by a night of sample processing, microscope work, data transcription. Midnight comes, we crash, and then start again. Pete in the field; Randi at the scope. The fish could save us a lot of trouble if they could just talk to us directly (though then we might be out of a job!). All of our effort is aimed towards a single goal: why are fish eating what they are eating? Simple question, perhaps, but it’s important. Together with collaborators Dr. Michael Berumen (KAUST, Saudi Arabia) and Dr. David Raubenheimer (Massey University, New Zealand), we're studying some of the most important and charismatic fish on the reef -- parrotfish and butterflyfish. It is a deceptively simple question to ask why these fish are eating what they are eating, but we first have to figure out what they're eating. 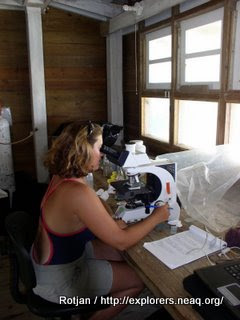 To that end, we follow fish around the reef, while counting the number of bites and recording the prey items. Then, we collect samples to bring home for nutritional analysis. But that's not enough – are the fish really eating what we think they are eating? It may look to us, for example, like a fish took a bite of macroalgae. 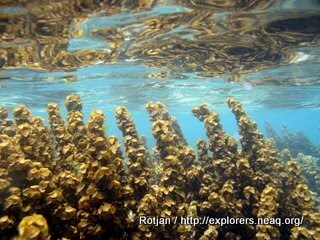 But remember that coral reefs are among the most complicated ecosystems on the planet and algae is NOT just algae… it can be encrusted with sponges and hydroids, covered with epiphytes, or be host to lots of tiny crustaceans and other organisms that find refuge in the dense foliage. So, did the fish eat algae, or something ON the algae? The mystery continues. Next step: bring the fish into the lab and offer them more isolated food choices. This algae or that algae? With sediment or without? With extra protein? Or perhaps the fish prefer a fatty diet? Lean? Getting closer – fish make very deliberate decisions that we dutifully record in our lab notebook. But, what are the fish actually digesting? To answer that question, dear readers, we carefully collect fish excrement, place it in tiny vials, examine it under the microscope, and then preserve it to bring home for nutritional analysis. We will then do some basic arithmetic: food in - food out = food digested. And just when you think you finally have the answer.... some smart blog reader will ask: Do juveniles and adults have the same diets? What if the preferred food type isn't available? 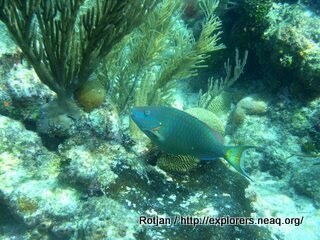 Do fish in Belize have the same preferences as the same fish species elsewhere in the Caribbean? 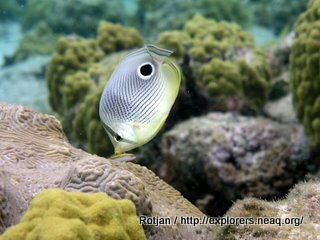 Do different fish species prefer different food types? Does food preference change with season? Reproductive period? Lunar cycle? What if food quality changes? What if fish density changes and competition regulates access to preferred prey? Does metabolic need change in higher temperatures? Lower temperatures? Etc etc etc.